Ideally, we’d all be able to spend as much time as we wanted in college. It’s the perfect place to do some self-discovery. The breadth of human knowledge is on the table for your perusal — at least in theory. You might take a random elective class (astronomy, anyone?) and boom: You suddenly realize it’s your undying passion. But in a world where college is, unfortunately, not free, an exploratory collegiate jaunt and a year or two of super-seniordom just isn’t possible for most of us. In fact, with student loan debt at an all-time high, you probably want to get yourself out of college as quickly as humanly possible — if you even take the plunge at all. You might be surprised to learn some colleges will actually reward you for getting out of their hallowed halls on time. You’d think they’d want you to stick around, since they stand to earn more cash from your extended tuition and fees. But as it turns out, the traditional four-year degree path isn’t as common as you might think. As of 2008, more than half first-time bachelor’s recipients took longer than four years to get there, according to National Center for Education Statistics. The median figure was 52 months, which works out to about one extra semester. Students who stay in school forever aren’t entering the workforce — and they’re also bloating the already-ridiculous total sum of American student debt. As a result, many schools are offering students tuition reimbursements and other incentives for graduating on time. So if you’re looking to get in, get out and get on your way, you might want to consider the following colleges and universities. 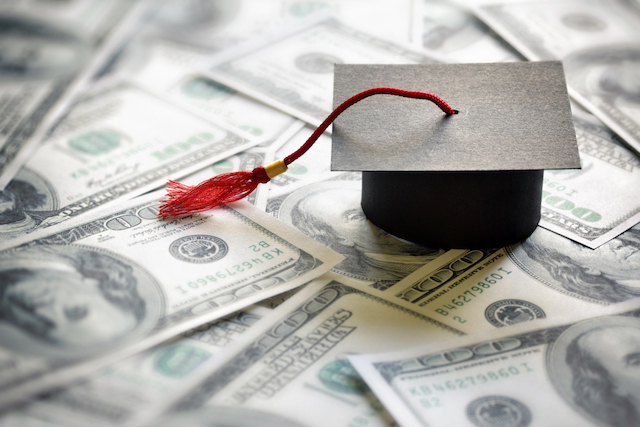 A word of caution: A $1,000 check after you walk across the graduation stage would be nice, but in the long run, it’s not a whole lot of money, so consider your options carefully. Many of these reimbursements and rebates have rigid requirements that would make it difficult to change your major or enroll undeclared. And working all the way through a degree in a field you end up hating is not a good idea. If you start out in pre-med only to discover you can’t stand the sight of blood, you should change your major — even if it means you don’t graduate on time. No amount of money is worth your long-term happiness and wellbeing. That said, these programs might motivate you to think again about whether or not you’re ready to go to college right now. If you don’t know what you want to do, it might be worthwhile to take a gap year (or three). You may also discover you don’t even need to go to college in the first place! Here’s where to apply if you want to get paid for your collegiate efficiency. Earlier this year, FGCU announced the Governor’s Challenge Rebate program, designed to incentivize students to get out of school — and into Florida’s workforce — in a timely manner. And although its stipulations are stringent, it’s quite an incentive. According to the statement, students who A) declare a major during their freshman year, B) finish that degree on time and C) land a job paying more than $25,000 within six months of graduation will be repaid any tuition cost they paid out of pocket during their freshman year up to $4,200, based on 30 credit hours. Students must also seek job prospect counselling, utilize FGCU’s Career Development Services and participate in job fairs and internships. In short, you have to prove you’re really, really looking for a job. The inaugural class started during summer and fall of 2015, and all future freshmen students are eligible. Starting this year, Howard University will cover half the cost of a student’s final semester if the student graduates early or on time, according to CNN Money. Supposing that cost includes tuition and mandatory fees — and not the necessary extras like, you know, food — it works out to a savings of $5,992.50, using the school’s most recently published rates. Students at any public Texas University — yes, including Texas A&M — can earn a tuition rebate of up to $1,000 if they graduate within their chosen program’s given constraints. That’s usually four years, but can be up to five for degrees like architecture and engineering. However, to be eligible, you pretty much have to know what you’re studying from the get-go. Students must graduate having “attempted no more than three semester credit hours in excess of the minimum number of hours required for their degree,” according to College for All Texans. Translation: Taking that cool-looking class that has nothing to do with your pre-law path might disqualify you from the rebate. And if you’re entering undeclared, you don’t have a whole lot of wiggle room to figure yourself out. You must also remain a Texas resident and pay in-state tuition at all times while pursuing your degree. Check out the full details here. Over the next two years, the commonwealth of Massachusetts will “phase in” a tuition rebate program for students who take the (very Penny-Hoarder-friendly) route and attend community college before university. “Students from any community college who enroll in one of two dozen fields of study would receive a 10 percent rebate on tuition and fees upon successful completion of each semester,” according to Boston.com. Furthermore, students’ initial tuition and fees would be frozen throughout the length of their studies. Aside from choosing an approved discipline — the list doesn’t include engineering or nursing — students must maintain a GPA of 3.0 or higher, receive their associate degree in two and a half years and finish their bachelor’s degree at a state school no later than four and a half years from their start date. The deal includes any University of Massachusetts campus. Unless your program is a special circumstance, once your time is up, you’ll likely be subject to tuition hikes. Even with tuition reimbursement, college is expensive. And trust me, you do not want to start out your #adulting adventure with a giant mound of student debt. So it’s worthwhile to take all the help you can get when it comes to paying for school… and no, we’re not talking about out of mom and dad’s pocket. For starters, check out these 100 scholarships, and 100 more that are a little bit… weird. Scholarships and grants are free money, well worth the time and effort it takes to apply! And since you’re busy listing prospective schools, check out the best value colleges — some of the ones that offer the most generous need-based aid might surprise you! Last but not least, don’t forget: Not everyone has to go to college. If you decide the traditional college experience isn’t for you, you could try an apprenticeship, or an alternative course to help you train for a well-paying career. Lots of other jobs have good salaries and don’t require degrees — here are some of the fastest-growing this year. Your Turn: Would you expedite your college experience for a tuition rebate or reimbursement?